The Holyoke Public Library, seen from the corner of Maple and Essex Streets in Holyoke, around 1910-1915. Image from Illustrated & Descriptive Holyoke Massachusetts. The Holyoke Public Library was established in 1870, and originally consisted of around 1,200 books that were housed in the Appleton Street School. Then, in 1876, the library moved to a room in city hall, where it was located for the next 25 years. However, in 1897 the Holyoke Water Power Company offered this lot, bounded by Maple, Cabot, Chestnut, and Essex Streets, to the library. The only stipulation was that the library must, within three years, raise enough money to construct a building on the site. This goal was ultimately achieved, thanks in part to the contributions of some of Holyoke’s prominent industrialists, including silk manufacturer William Skinner and paper manufacturer and former Congressman William Whiting, who each gave $10,000. Another $10,000 came from the prominent financier J. P. Morgan, whose ancestors had once lived in Holyoke. The building was designed by noted local architect James A. Clough, who provided the plans free of charge. The exterior was built of limestone, and included classically-inspired elements such as a columned portico, which gave the building the appearance of a Greek temple in the midst of a modern industrial city. It was completed in 1902, and Whiting, who had served as the library’s president since 1870, gave the dedication address. 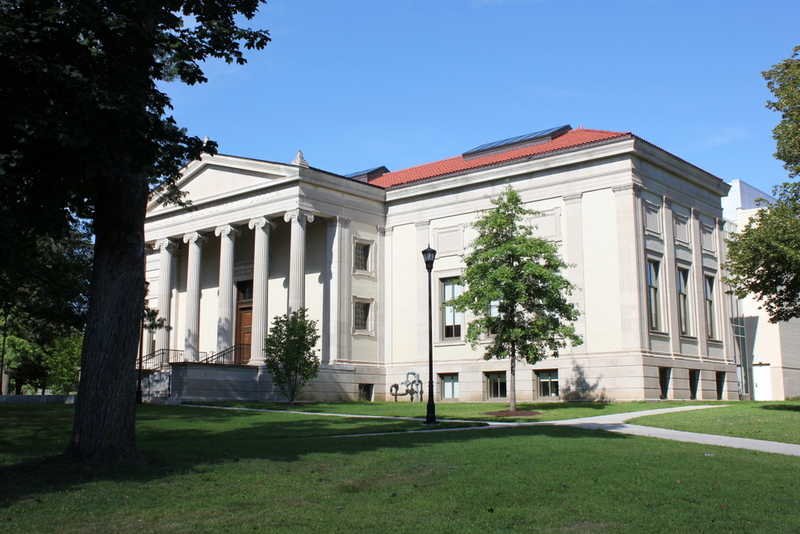 At the time, the the library’s collections had grown to more than 20,000 volumes, and the building featured space for periodicals, reference works, and a children’s department. Within a decade, it would also house a natural history museum, which was later moved to the Wistariahurst museum. 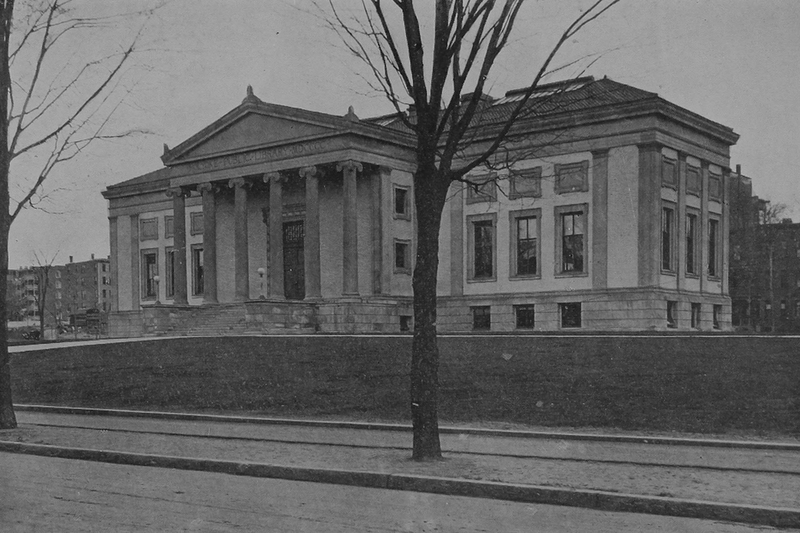 The first photo shows the library as it appeared around the early 1910s. Since then, it has continued to serve as the city’s library for more than a century, although it has recently undergone significant changes. Between 2011 and 2013, it was renovated and expanded, with a large addition to the rear on the Chestnut Street side of the building. This project involved demolishing the old wing that housed the library stacks, and replacing it with a modern steel and glass structure that sharply contrasts with the original architecture of the building. However, the rest of the building was preserved as part of the renovations, and very little has changed from this view, aside from a small portion of the addition that is visible on the far right. The Steiger’s store at 259-271 High Street in Holyoke, sometime around 1910-1915. Image from Illustrated & Descriptive Holyoke Massachusetts. For nearly a century, the Steiger’s department store was a leading retail chain in Western Massachusetts and throughout much of New England. It was founded by Albert Steiger, who had come to the United States as a young German immigrant in 1868. He and his family settled in Huntington, Massachusetts, but his father died in 1872, when Albert was just 12 years old. Albert was the oldest of three children, and by the time he was 13 he had left school and was working as a peddler. Soon after, though, he began working for a dry goods merchant in Westfield, and would remain there for the next 20 years. After spending his early career in Westfield, Albert Steiger went into business for himself in 1894, when he opened a store in Port Chester, New York. This proved successful, and two years later he opened a store in Holyoke. 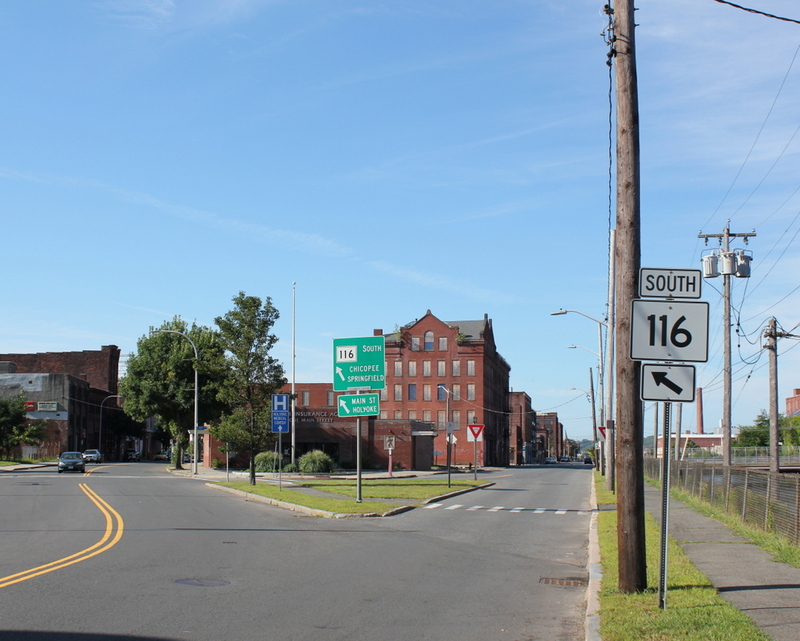 At the time, Holyoke was a thriving industrial city, and it had a busy commercial center along High Street. Steiger soon purchased property here on the west side of the street, directly opposite city hall, and had this building constructed on the site. It was designed by prominent local architect George P. B. Alderman, and featured a Beaux Arts exterior, with light-colored stone that contrasted sharply with the dark brick and sandstone of the older buildings on High Street. When completed in 1899, the building only consisted of the three window bays on the right side, but in 1901 Steiger acquired the neighboring Preston Block on the left side and expanded his building. 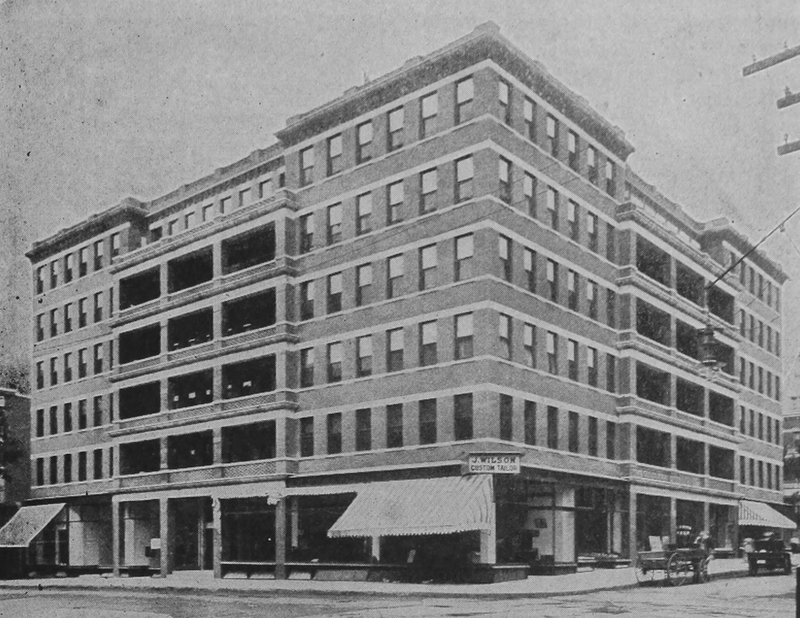 The Preston Block was either demolished or incorporated into the Steiger’s building, and Alderman designed the facade of this addition. It matched the rest of the building, but it resulted in an asymmetrical appearance, as seen in these photos. The high character earned by eighteen years of honorable business dealings, and the energy, business ability and liberality that characterize all the operations of this house, command for it a conspicuous position among the leading mercantile institutions of the state. The company is conducting similar establishments in Springfield and New Bedford, Massachusetts and Portchester, N. Y. The exceptionally low prices that prevail in this store have been the cause of much comment, but there are reasons for it that are legitimate ones and in no sense secret; in purchasing in the enormous quantities required for stocking four large stores, the management is able to take advantage of substantial discounts, which in the end is made to benefit the consumers in the low prices which they can offer. The local store is under the management of Philip Steiger. It is an attractive building, constructed of Indiana Limestone and brick; its interior has a full complement of modern fixtures and furniture, including the Lamson Carriers. There are thirty-one distinct departments, any one of which presents some attractive bargain at all times. One hundred and fifty clerks are employed. Steiger’s would eventually open locations in Fall River and in Hartford, but by the 1960s the company had begun to shift toward stores in suburban shopping malls. 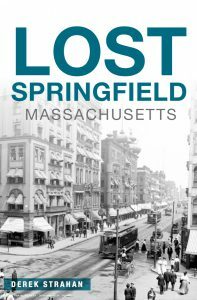 These included stores in Westfield, Longmeadow, and Hadley, plus two new Springfield stores, with one at Springfield Plaza and one in the Eastfield Mall. Then, in 1979, Steiger’s opened a second Holyoke store in the newly-completed Holyoke Mall, drawing even more customers away from the old store here on High Street. The old store finally closed in 1984, and the building sat vacant for many years afterwards. In the meantime, the Steiger’s company remained in business for another decade, until it was sold to the May Department Store Company in 1994. 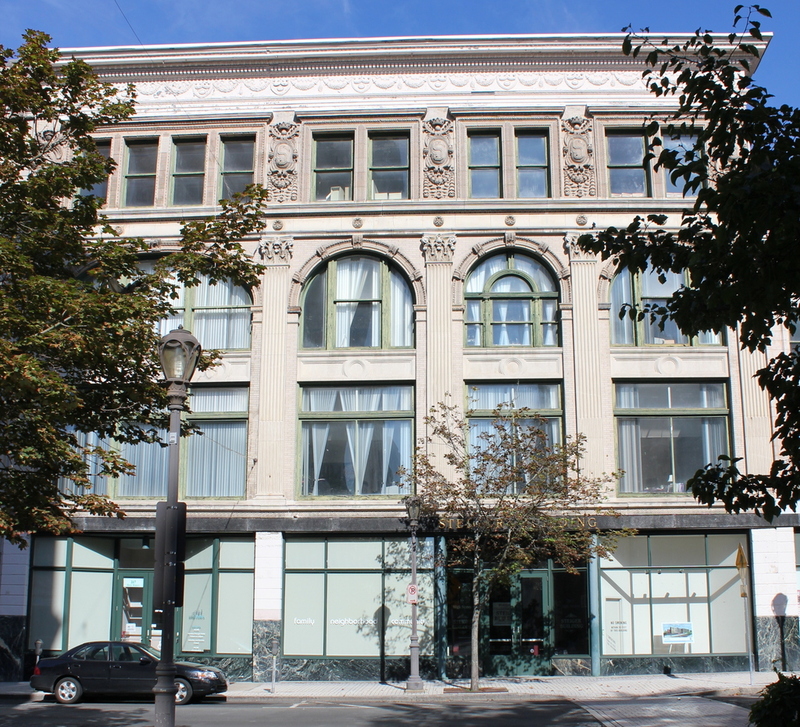 Some of the stores were reopened as either Lord & Taylor or Filene’s, but others were closed, including the flagship store in downtown Springfield, which was subsequently demolished. However, the former downtown Holyoke store is still standing here on High Street. 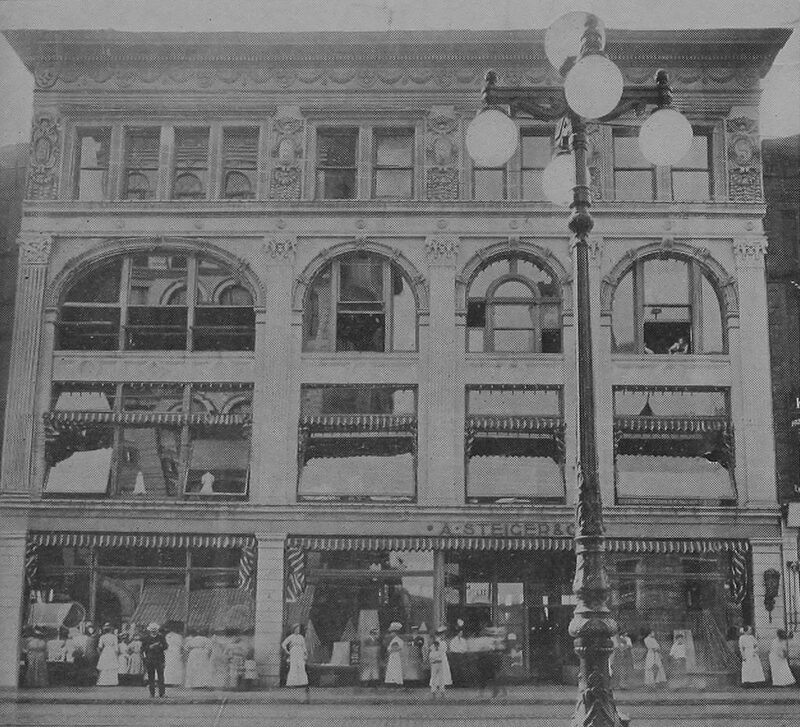 Its exterior has seen few changes since the first photo was taken more than a century ago, and it survives as a reminder of the grand department stores that once stood in the downtown area of almost every major city in the country. Along with the other surrounding commercial buildings, it is now part of the North High Street Historic District on the National Register of Historic Places. The corner of Main and Race Streets in Holyoke, around 1891. Image from Holyoke Illustrated (1891). 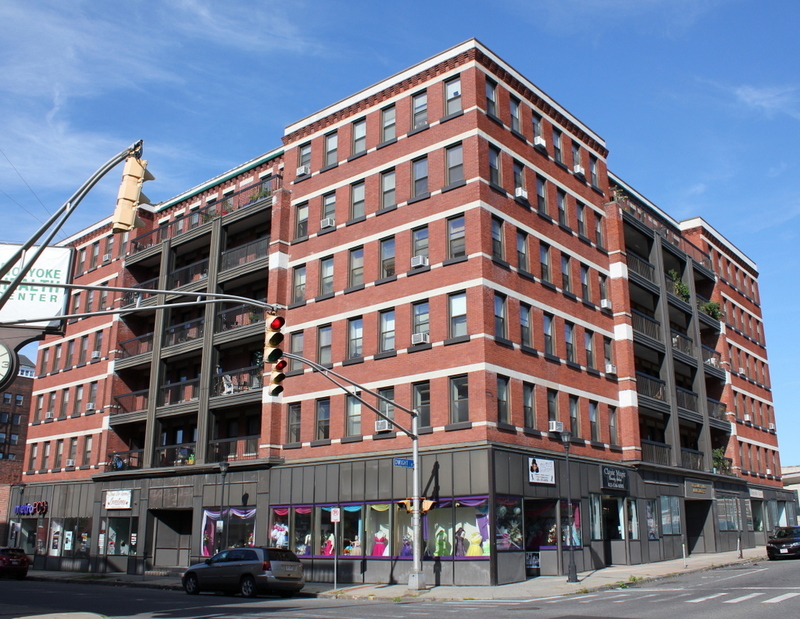 Long before the more famous Flatiron Building was built in New York City, Holyoke had one of its own. At only four stories, it was much shorter than the skyscraper in New York, but it was built on a similar triangular-shaped plot of land here at the corner of Main and Race Streets. It was completed sometime in the 1870s, and was originally owned by the Parsons Paper Company. Although formally known as the Parsons Block, it had acquired the nickname of the Flatiron Building by the early 1890s, a decade before the one in New York was completed. 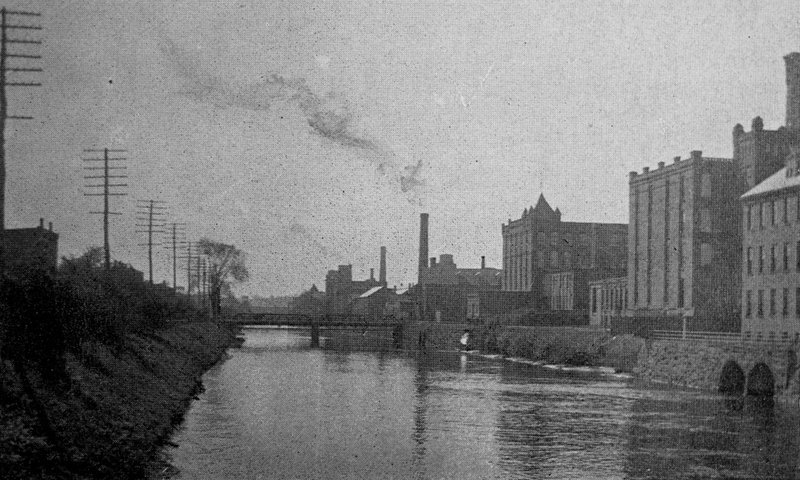 The Parsons Paper Company was the oldest paper mill in the city, and had a factory a few blocks away on Gatehouse Road. 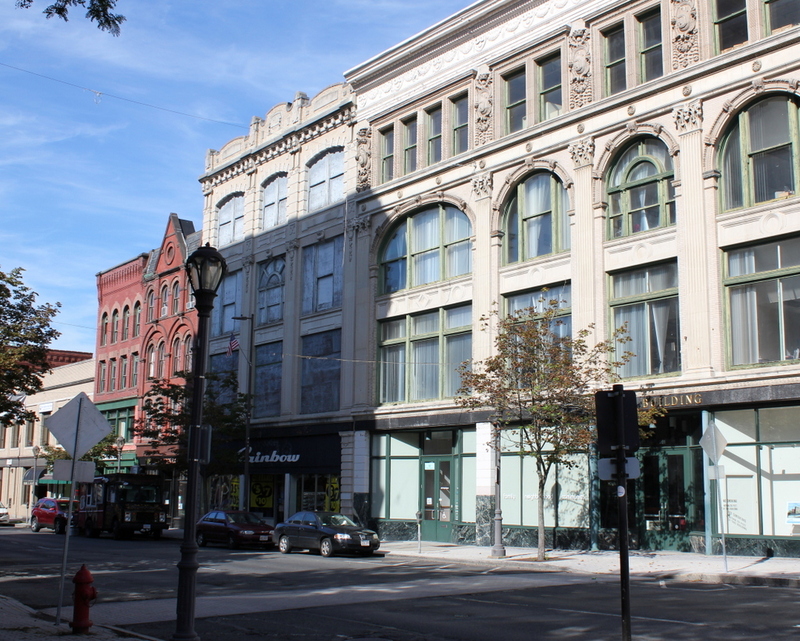 The company rented space in the Flatiron Building to a variety of commercial tenants, including several stores on the ground floor. Among these was the C. E. Ball & Co. drugstore, which occupied the prominent storefront at the “point” of the building when the first photo was taken. The business later became the drugstore of Charles E. Bardwell, and was located here in this building during the early 20th century. Mr. Tower’s office itself is one of the best possible for its purposes. It is located in what is known as the “Flatiron Block,” at the junction of Main and Race streets, a few rods from the Connecticut River railroad, and occupies the norther portion of the second story. On the eastern side, with entrance near the head of the stairway, is the suite of apartments occupied by Mr. Tower and his draughtsmen and assistants, beyond which is a private apartment or consultation room. A long-distance telephone is at hand in a convenient closet. The draughtsman’s room is on the west side of the block, into which one steps directly from the general offices, and is one of the finest apartments for the purpose imaginable. 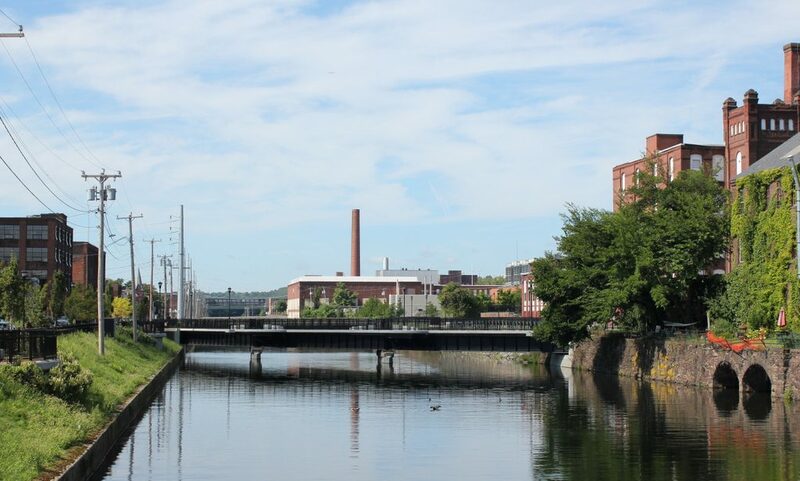 In 1899, the Parsons Paper Company was acquired by the American Writing Paper Company, a trust that included many of the paper mills in Holyoke and elsewhere. The Flatiron Building became the corporate headquarters, and its offices were located here throughout the first half of the 20th century. During this time, American Writing Paper sought to compete with other paper trusts, including International Paper, which had been formed a year earlier in 1898. At one point, American Writing Paper produced about 75 percent of the country’s fine paper, but the company was ultimately plagued by many years of mismanagement and labor problems. Its offices remained here in this building until 1952, and by the 1960s the assets of the once-powerful company were liquidated. Different sources give conflicting dates for when the Flatiron Building was demolished. This may have occurred in either the 1950s or 1960s, but, according to city records, the present-day building on the site was constructed in 1953, suggesting that the Flatiron Building was demolished soon after American Writing Paper relocated its offices. Today, very little is left from the first photo. The former location of the Flatiron Building is now the site of two nondescript one-story buildings, and most of the buildings on the left side of Main Street are also gone, except for a few in the distance near the corner of Dwight Street. Near the center of the photo is the Hotel Hamilton, which was also once owned by the Parsons Paper Company. The historic building is still standing, but it has been altered over the years, and it is now boarded up and abandoned. A row of commercial buildings on the west side of High Street, between Dwight and Suffolk Streets in Holyoke, around 1891. Image from Holyoke Illustrated (1892). The first photo shows High Street as it appeared around 1891, when Holyoke was at the peak of its prosperity as an industrial city. These commercial blocks had all been built only a few years earlier in the 1880s, and housed a variety of businesses and professional offices. The three most visible buildings in the center of the photo all featured ornate Romanesque Revival-style architecture, and formed a nearly symmetrical group, with many similarities between the buildings on the right and the left. To the left of the Preston Block, in the center of the photo, was the Tilley Block. 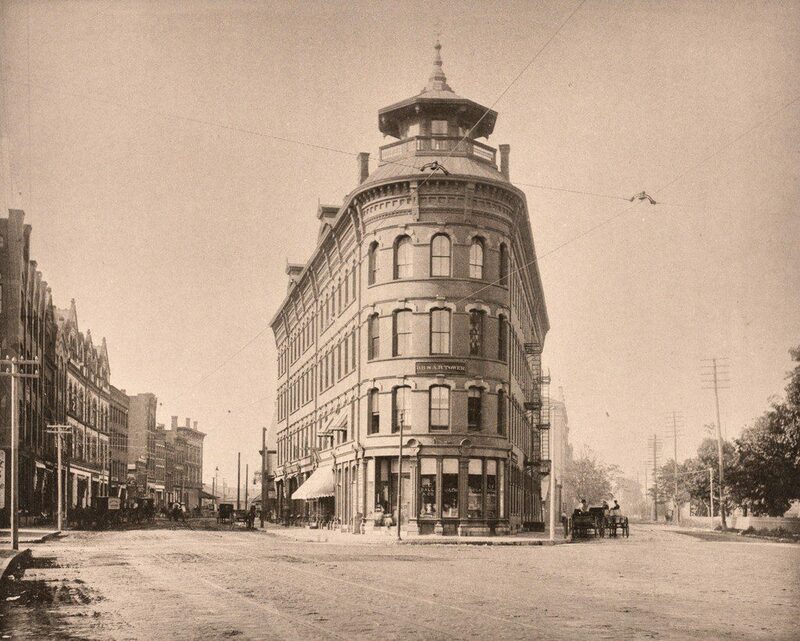 It was built in 1888 and was owned by John Tilley, who ran a furniture, carpet, and bedding store on the ground floor. Further to the left, on the other side of the Tilley Block, was the Taber Block, which was built around 1884. Its design was similar to the Preston Block, although somewhat shorter and with a brick facade instead of rusticated stone. When the first photo was taken, the storefront on the ground floor was occupied by Frank L. Taber, a jeweler and watchmaker. 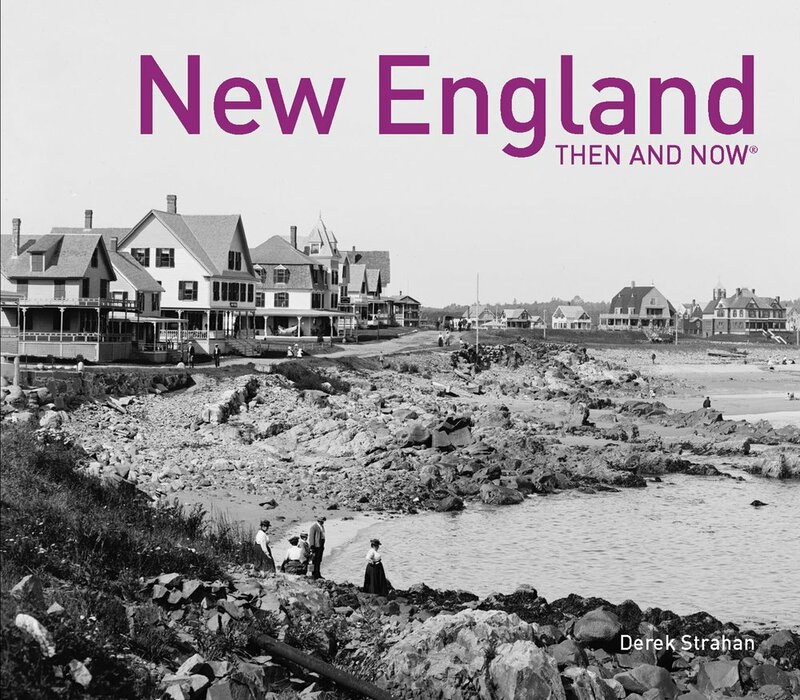 Today, very little is left from the 1891 scene, although nearly all of these changes came within just a couple decades after the photo was taken. 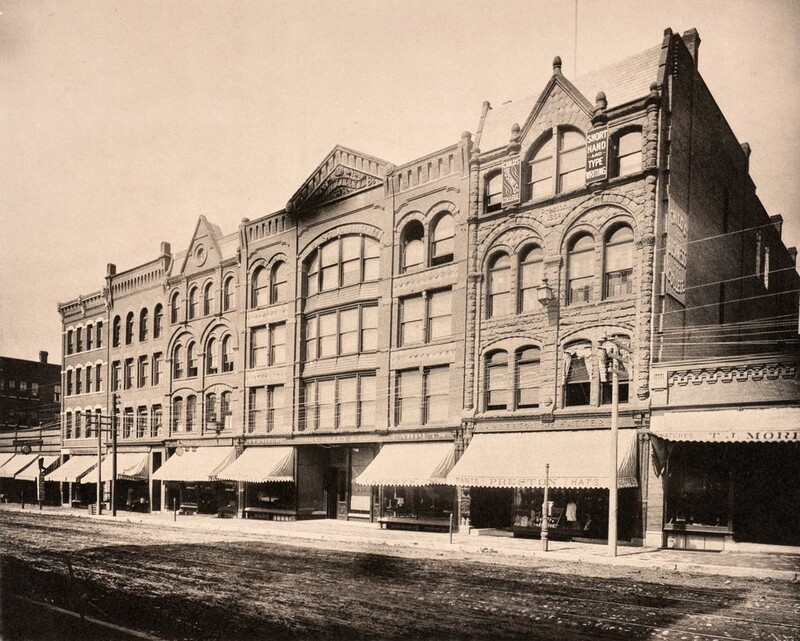 The first change came only a few years later, in 1899, when the one-story building on the far right was demolished and replaced by the Steiger’s department store. This Beaux Arts-style building was designed by prominent local architect George P. B. Alderman, and featured a light-colored exterior that contrasted with the darker brick of the older buildings in the scene. Two years later, in 1901, Albert Steiger purchased the adjoining Preston Block and expanded the store. It does not seem clear whether the Preston Block was demolished or simply incorporated into the Steiger’s building, but either way the stone facade of the Preston Block was replaced by one that matched the rest of the department store. The trend toward Beaux Arts architecture continued around 1912, shortly after the Tilley Block was purchased by Thomas S. Childs. The building itself evidently survived, but the facade was rebuilt to match early 20th century architectural tastes, with a design that was also the work of Alderman. Childs was a shoe and hosiery dealer, and his store occupied the ground floor of the building, where Tilley’s furniture business had once been located. Like Steiger’s, the Childs shoe store would remain a fixture here in downtown Holyoke for many years, but it was gone by the early 1980s. Today, the ground floor still has a commercial tenant, but the three upper floors of the building are boarded up. Of the three buildings in the center of the first photo, only the Taber Block survives relatively unchanged. Its neighbor to the left, the c.1890 Bishop Block, is also still standing from the first photo, although the exterior of the second floor has been rebuilt with new windows. Overall, though, this section of High Street has a remarkable number of historic commercial buildings from the late 19th and early 20th centuries, and these buildings are now part of the North High Street Historic District on the National Register of Historic Places.